Welcome to the THE CELLAR blog tour! 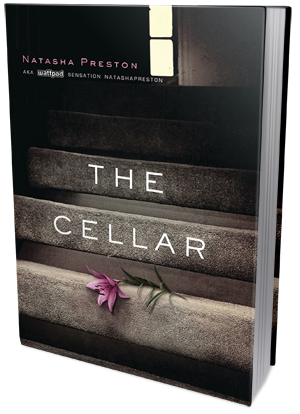 Today we have the pleasure of featuring the WATTPAD sensation, Natasha Preston, and her most recent book, THE CELLAR! I enjoyed THE CELLAR enormously and can't recommend enough, especially to fans of gritty thriller stories and dramatic plot lines :) It's a real nail biter! We also have the pleasure of sharing a wonderful guest post written by the lovely and talented Natasha, as well as hosting a giveaway of one copy of THE CELLAR - don't miss it! Loneliness was like a terminal disease. With every passing day you faded just that little bit more. I missed her so much it physically hurt, like I was being punched in the gut over and over. All I could do was look, and that hurt even more. I had promised her I would never let anyone hurt her, and I failed her. They were as pure as flowers. Almost as disturbing and heartbreaking as Elizabeth Scott's Living Dead Girl, The Cellar tells a story of kidnapping, abuse, murder and mental illness. A gut-wrenching and emotionally affecting story of desperation and fear, but also hope and survival. It's a well-written, completely absorbing nail-biter of a book, and I'm really glad I decided to pick it up! Told in three alternating voices, The Cellar kicks-off with the kidnapping of 16-year-old Summer Robinson. Taken by a stranger, forced to use a different name (Lily) and locked in a cellar of her mentally deranged kidnapper, Summer spends days after days, months after months, desperately clinging to hope that one day she'll escape or someone will find her, and she'll be able to see her beloved family and boyfriend again. She's not alone in the cellar. There are three more girls living there with her. Girls the kidnapper refers to as Flowers: Poppy, Violet and Rose. Some have been living there for much, much longer than others. They're all forced to participate in a sickening little show, pretending to be the kidnapper's family, following his bizarre rules and silently taking the physical and mental abuse when his extremely fragile mental health occasionally takes a dive off the proverbial cliff. The things these girls go through, the horrors they're subjected to, all the bloody murders they witness.. it's all painted breathtakingly vividly. These images really stay with you. They mess with your head and make you stop and consider your own safety. Should you really be walking around at night all by yourself? Is your neighborhood safe enough? Do you really know your neighbor? The Cellar sports a powerful, suffocating atmosphere of dread and uncertainty. It's a book that not only makes you feel things (fear, compassion, anger, disgust), but also changes your perception and makes you wonder what would you do in a similar situation. How would you react to certain things? Would you be strong enough to live through all this? I really loved the fact that the story was told in three alternating POVs: Summer's/Lily's, Lewis (Summer's boyfriend) and Collin's/Clover's (the kidnapper). I especially appreciated the short but very insightful glimpses into Clover's disturbed psyche. The chapters written in his point of view were quite enlightening, providing the reader with a pretty good idea of just how sick and unstable he was. The occasional flashbacks - particularly of the relationship with his mother and father - helped me understand his character a little better. And while I certainly had no sympathy for him, I definitely appreciated the insight into his past that the author provided. Similarly, the chapters written in Lewis' point of view provided me with a different kind of insight - they helped me understand the relationship between Summer and Lewis, as well as Summer and her family members. Through his eyes, we got to witness the love, care and affection these people had for each other. Their dedication to one another was moving, but also completely heartbreaking, considering the horrible situation they found themselves in. Summer herself was a great narrator. I found her very believable and carefully fleshed out. Her behavior seemed appropriate for the situation she was in, she wasn't trying to play the hero, she was scared, angry, desperate and slowly losing hope of being rescued. Her thoughts and feelings were easy to relate to. I felt really sorry for her. Overall, I thought this was a really good story. Well-plotted, full of suspense and intensity, emotional and gripping. I would've easily given it 5 stars if not for the fact that the ending itself fell a bit flat for me. Some aspects of it I really liked (the emotional and psychological aftermath), others disappointed me a bit. I guess I just needed a bit more in terms of Clover's punishment. I'd also love a chapter or two focusing on the other girls and what happened to them. Nevertheless, despite its minor shortcomings, The Cellar makes for a solid thriller that fans of the genre are sure to enjoy immensely. I'm looking forward to Natasha Preston's next books. After writing on Wattpad for three and a half years and self-publishing I’ve been asked quite a few times what advice I’d give new writers. Each time I say write what you love. When you start out it’s all about having fun, getting words down on paper and learning how you write and what you want to write. Don’t worry too much about plot holes or spelling and grammar because those are all things that can be worked on and fixed when you have something to work with. I have a few word documents with the very beginnings of stories that I will never continue. Scrapping something I’d started used to get to me, I thought it was wasted time. It’s not. It’s practice and the more you do it the quicker you’ll learn what idea is or isn’t going to work. Not to mention you’ll be improving your writing the whole time. I look back on early things I’ve written and want to cry sometimes but at least I can see how much I’ve improved. Do that! Keep old things that you’ve binned as an idea so you’ve got something that proves you’re a better writer than you were. It’s also a great pick-me-up when you’re feeling deflated and want everything writing related to just go away! Read as much as you can and allow others to read what you’re writing and take on board what they say; constructive feedback helps you grow as a writer. Most importantly believe in yourself. Writing a novel isn’t the easiest thing and it’s easy to get caught up in the massive task but put aside all negative thoughts of not being able to do it and write that book! Thanks to the fabulous folks at Sourcebooks Fire we have one copy of THE CELLAR to give away to one lucky reader!